Fringe Technical Director Gabriel Pinto occupies Saturday night with a sax solo. Finally a cross-town collaboration between Lemoyne and SU (well,sort of). 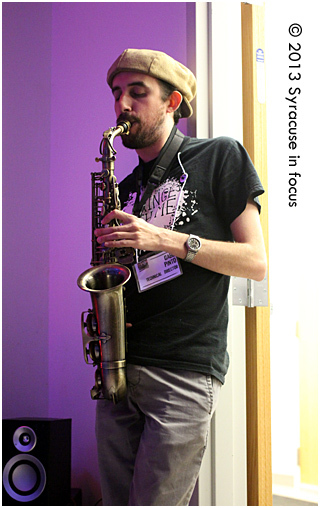 Le Moyne alums Jacob Ellison and Justin Sullivan used creativity and crowd funding to pull together the inaugural Syracuse Fringe Festival last weekend, and it was held at the Community Folk Art Center along the Connective Corridor. The event featured three days of multi-disciplinary artistic endeavors. We checked out the final day of the program, which featured David Doyle, Ruth Arena and Anna Phillips. Fringe was very reminiscent of the THINC Sideshow parties from a decade or so ago (except the demographic for the Fringe was slightly older). What was most surprising on Saturday was to watch Phillips, who is the artistic equivalent of a love child between Missy Elliot (always ahead of the curve) and Steven Wright (wry humor), do a comedy show in the Black Box Theater and smoothly transition into a monologue about her life that was more compelling than a episode of HBO’s In Treatment. Was it Something She Said? Anna Phillips kept it real for Spatial Profiling. Not that it wasn’t good, just unexpected. We look forward to Anna’s upcoming gigs, where she will bring the noise again with jokes at two shows locally: Chicks are Funny and Guns n’ Syrup. This entry was posted on Monday, June 24th, 2013 at 9:29 pm and is filed under Art. You can follow any responses to this entry through the RSS 2.0 feed. You can leave a response, or trackback from your own site.